My plastic pool has a whole at the bottom. How do I patch it without draining the water? Is there any type of glue that will work under water? Hi. If you are talking about a vinyl lined above ground pool the best patch kits are made by Boxer. You just cut a circle shape out of the patch material, add the glue and put it over the hole. You can then come up for air and hold your big toe over the patch for a couple of minutes while the glue dries. The water does not need to be drained to patch a hole in a vinyl pool. My brother in law would use his kids and a bowling ball. They would put the patch on the hole and set the bowling ball on top of the patch. After about ten minutes the pool was as good as new. If you have an Intex type pool they have there own special patch kit you should use. These kits can be found at stores that handle Intex pools. Standard vinyl patches should work on holes in the inflatable ring pools. 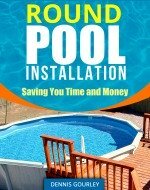 This page about holes in an above ground pool might help also. We have just set up and filled our pool only to realize that there is a hole that water is trickling out of. Can we patch a pool that is full or do we need to drain it? Hi Chris. Water trickling out of a new pool is not a good thing. That very likely means the liner has a bad seam and should be replaced under warranty. Patching a torn seam is something I do not recommend. Any other kind of hole can be patched under water without a problem. When water is visibly coming out of the pool the source is usually a hole around the outer edge somewhere. It should be easy to find and just as easy to patch. This is also the area where the bottom of the liner attaches to the side with a seam. If the seam on a liner is going to go bad, it usually happens on the initial fill up. 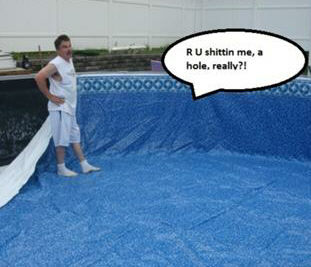 It is always a major let down to find a hole in a brand new above ground pool liner. I hope yours is one that can be patched. This photo was sent to me by someone who noticed his problem before he had the liner completely installed. I just found a hole in my above ground pool. I looked for it after noticing water all around. The pool still has more than half its water in it. Can it be patched with the water still in it or do I need to drain it? Hi. The worst thing you can do is to drain the pool. Vinyl liners shrink as soon as they are empty. If the liner is over a couple of years old it could easily shrink and become unusable. So no, do not drain the pool. I have always found the patches to stick better when the liner is wet as opposed to a dry liner. Boxer vinyl patch glue is what I use, it works great underwater. It works even better when you can use actual vinyl instead of the patch material that comes with the kit. Many pool stores sell small pieces of pool liner so if that is possible you should consider buying some. With every pool I install I give the customer the vinyl from the skimmer and return area, telling them someday they may come in handy. The clear plastic in the patch kit discolors after a year of so, with actual liner material you will probably not even know the pool has been patched. You need to cut the patch material into a circle shape, a couple of inches bigger than the hole. You put plenty of glue on the patch and take it under water and place it over the hole. You then come up for air and place your big toe over the patch and hold it in place for a couple of minutes. There are times when it is necessary to drain the pool in order to find the hole. 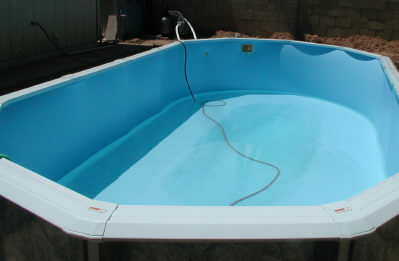 The photo below is a good illustration of how much water you should always leave in a vinyl pool. Never go below this amount. We have a 12'x18' oval pool, a little over a year old. Today I felt a loose spot with my foot. Instead of being solid on the bottom the liner is loose, or floats a bit. The area is approx. 18 inches in diameter. Does this indicate a hole in the liner? Could there be too much water from the sprinkler system? What do you suggest? Hi Rod. It sounds to me like a hole in the liner. I would put on the goggles and go down and inspect this area. If you can find a hole it can be repaired without having to drain the pool. You would just need to get a boxer patch kit and follow the instructions. Patching a pool is as easy as cutting a round patch, coating it with glue, folding it in half and taking it down to the bottom and placing it over the hole. You can then move your big toe over the patch and come up for air. Hold the patch with your toe for a minute or two and you are done. I doubt the floating liner is coming from an outside sprinkler system. A sprinkler head under the pool that was not capped would do this. I have had this happen a few times. Most of the time the customer said the sprinkler lines in the yard are no longer in use and to ignore them. A year or two later, for some reason, they get turned on and I get called out to take a look. This page might help also.